“I am delighted to welcome you to the Wilson Stuart School website. At Wilson Stuart, we are determined that all our students make outstanding progress and succeed. We aim to support them all to do their very best, enjoy school and to develop important qualities such as respecting, understanding and helping each other. We have high expectations for our students and have created an environment in which each individual is supported and challenged to achieve their full potential, both inside and outside the classroom. Accordingly, we expect our students to be ready to learn, to work hard and to take pride in their achievements. Wilson Stuart has developed a range of excellent facilities to support student learning. We also have an exciting and rich curriculum which provides all of our students the opportunity to experience and enjoy a wide range of activities. We believe that working together pays dividends. We have a very active Parents Association and we offer a great deal of support to enable parents to support the education of their children. We have outstanding relationships with our local community, schools and businesses, their partnerships providing great benefits to our school and students. Many classes have taken part in making an ‘egg’ themed piece of art, they are amazing! There work is so impressive it will be on display at a real art gallery over the Easter holiday! It is flat, good disabled access, disabled parking at Grace church car park and good disabled toilet facilities (you do need to get security key from office) I hope you are able visit and enjoy this brilliant celebration! On the week beginning the 1st of April, Wilson Stuart took a small group of 12 children from Key Stage 3 to Bendrigg lodge, in the Lake District for a week of Outdoor activities. After a long trip on the coach we arrived and explored the surrounding area. In the evening, after an amazing meal, the instructors took us to the sports hall where the students were split into two separate group, one having the opportunity try out the indoor cave and the other group doing a variety of activities such as Boccia, Curling and having a relax In the Sensory Room. On Tuesday we stayed on-site to have a go at rock climbing, abseiling, the sensory swing and indoor archery. For many of the students this pushed them to the extremes of their comfort zone, and allowed them to experience time outside of their wheelchairs. Everybody took part, not matter how adamant he or she were, that they did not want to. This day was the epitome of what Bendrigg is all about pushing yourself to your limit, and experiencing new things. In the evening we watched a film, so everyone could relax before going to bed. On Wednesday we went to Lake Windermere to go on the famous ‘Lake Windermere Cruise’ this was the most amazing day for all involved. It was something that many of us have never experienced before. Although a bit cold with some rain in the air, it was still a day never to forget. In fact, for many this was the best day spent together as a group. In the afternoon the group was split into two groups, some went on a Easter egg hunt around the grounds, aswell as some time in the games room and the other group did the amazing outdoor archery. In the evening some watched a film, while the others went to the sensory room. On the Thursday a trip was planned to the Ingleborough show Cave near Clapham. Two groups were formed to explore the cave and to learn about the rock formations inside the limestone cave. The evening was topped off with a disco, which was led by ‘DJ Antonio’ afterwards; there was a presentation of certificates to all the students who participated in the week. For the staff, the evening was spent packing the large amount of clothes the students took with them! Friday we woke up early to pack the coach and to have breakfast to set us up for the journey back home. Everyone thoroughly enjoyed our week away and many were sad to leave. Thank you to Mr Perrens for organising another successful trip to Bendrigg, and to all the staff for their constant support ensure the children got the most out of their time away. Lastly, I’d like to thank the children for their enthusiasm, and good behaviour which made the week away enjoyable for everyone involved. On Wednesday 20th March, Wilson Stuart was thrilled to welcome, not only 3 Ofsted Inspectors, but the A 4 Brass Quartet. They performed 2 concerts, one for all Primary Pupils and PMLD and the other for all the Secondary Pupils and 6th Form. The Quartet had a unique blend of instruments, with a cornet, tenor horn, baritone and euphonium, creating an exclusive sound that stands out from the standard brass quartet. With this unusual instrumentation, A4 Brass have actively developed their repertoire, commissioning new music, composing and arranging music themselves. We were able to host this lovely concert with the support of the “Live Music Now” charity, who heavily subsidised the cost. During the concerts, they explained about how the different sizes of the instruments relate to a difference in pitch – the smaller the instrument the higher the sound and the larger the instrument, the lower the sound. Some of the pupils even got very close up and were able to feel the vibrations by gently touching the bell of the instrument. All the pupils and the staff enjoyed a lovely morning, with everyone demonstrating excellent listening skills. 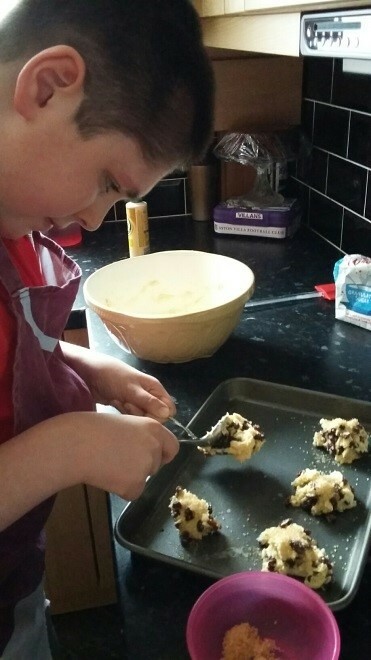 Great to see one of our Key Stage 3 students doing independent cooking at home over the weekend! Who else tries to develop new skills? PFPA will be once again holding our wonderful Mother’s Day Shop on Tuesday the 26th of March. This will be open from 9.00 – 12.00 and is for pupils to be able to purchase gifts as a “thank you” for their mum or carer. For students who wish to go to the Mother’s Day shop we are asking that they bring a maximum of £4 into school on Tuesday 26th March.